Tropical North Queensland is a spectacular holiday destination made up of nine distinct regions, each with their own unique charm, natural environments and attractions. The iconic Great Barrier Reef offers fantastic snorkelling and diving while Cairns, the gateway to North Queensland, offers a cosmopolitan tourist mecca. 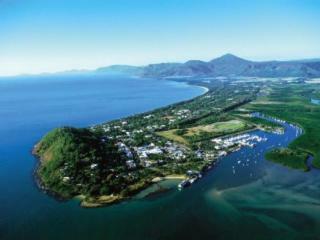 Nearby Port Douglas offers a charming seaside town ideal for relaxing but with plenty to see and do should you choose while Palm Cove offers the ideal tropical getaway near some of the region's most famous attractions. The Daintree offers an unbelievable rainforest ecosystem known as the 'oxygen factory' of the world while the relaxing waterfront destination of Mission Beach offers sprawling beaches and all the modern comforts. North Queensland accommodation is as many and varied as the holiday destination itself with a fantastic range of accommodation options to suit all types of holidaymakers and budgets. The Great Barrier Reef offers a great range of secluded lodges, hotels and resorts spread across its tropical islands with plenty of facilities, activities and family friendly options. 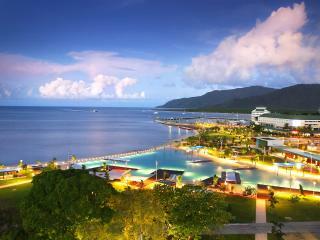 As a cosmopolitan town, Cairns offers stylish modern waterfront accommodation conveniently located within the city close to a range of shopping, dining, activities and attractions but away from the bustle of city life with plenty of space to relax by the sea. Nearby Port Douglas, Palm Cove and Mission Beach are also holiday meccas which offer a similar style of accommodation and facilities in a tropical laid back holiday hot spot. The wet tropics of the Daintree on the other hand offer a unique accommodation experience allowing you to be at one with nature with a range of self-contained and luxury lodges and eco-friendly and environmentally sustainable accommodation options in the midst of the lush rainforest and abundance of native wildlife. North Queensland offers a wide variety of activities, attractions and things to see and do including day trips, island cruises, snorkelling and diving, fishing and plenty of sightseeing of this unique part of the world. There are a number of small theme parks in Cairns which offer the opportunity to see crocodiles, snakes, koalas and kangaroos as well as learn about ancient aboriginal culture while The Esplanade offers a fantastic range of boutique shopping and fine dining options. The water fountains and shallow pools of the life guard patrolled Esplanade Lagoon is also popular with locals and visitors alike. The Skyrail Rainforest Cableway is a popular attraction and offers the best way to see this stunning location, high in a cable car. Port Douglas and Palm Cove offer plenty of activity and adventure with golf courses, horse riding, ATV tours, luxury boat charters, sky diving, white water rafting and fishing. The Daintree is home to 4WD rainforest tours as well as kayak and trek tours, river cruises and even the opportunity to get up close and personal with the resident crocodiles. Take in this awe-inspiring sight and spot a great range of native wildlife. Over at Mission Beach there's plenty to keep you entertained and you can even try white water rafting down the Tully River if you're feeling adventurous. 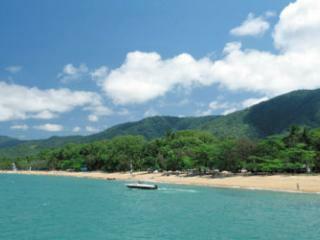 Thinking about travelling from Cairns to Port Douglas? Check out our travel guide.